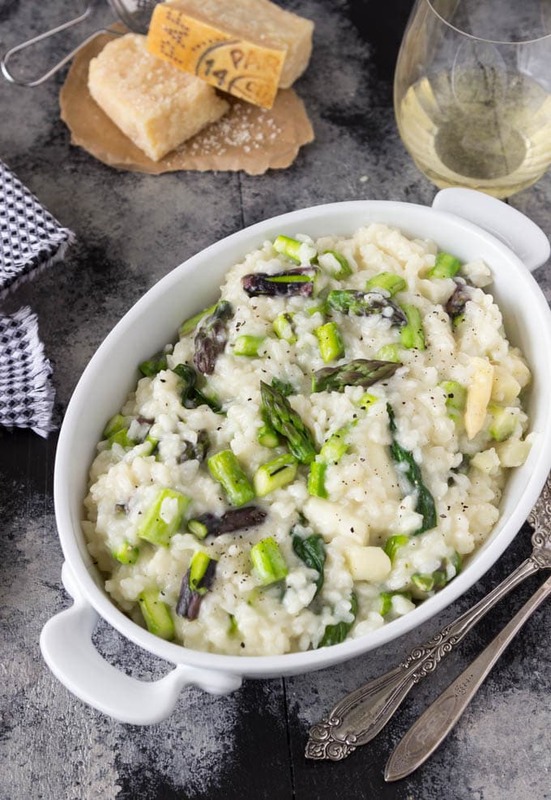 Tricolor Asparagus Risotto- This asparagus risotto is SO creamy you’d swear it has to include cream in the recipe! Oh no it doesn’t! The creaminess comes from the rice and the process of stirring the rice. Add fresh asparagus (purple, green and/or white) and freshly grated Parmesan cheese and you’ve got one tasty Italian meal. Have you ever seen Asparagus grow? Seriously! it grows so fast you can almost literally see it growing right in front of your eyes. During ideal spring conditions asparagus can grow up to 10 inches in a 24 hour period of time… that’s crazy! 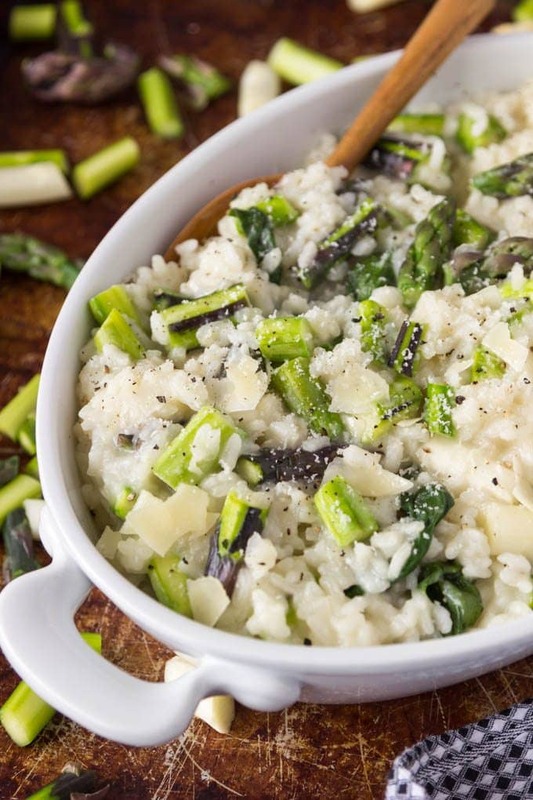 O.K…back to the Tri Color Asparagus Risotto! I got it in my head that I wanted to do a taste test and see if I could taste any difference between the different varieties of asparagus. Purple, Green and White. I’ve had them all before (and no surprise I’ve enjoyed them all) I’ve just never had them at the same time to really compare the tastes. I also got it in my head (my head is busy!) that I wanted to make an authentic Italian risotto. Yes, it requires a bit of consistent stirring but it’s SO worth it! Perfect ! asparagus taste test meets creamy risotto and I can check both off my “to do” list. For the risotto I’m using arborio rice (found in most grocery stores) because it’s a must if you want really creamy risotto. The process of making a risotto requires a little patience and some consistent stirring but your efforts will be rewarded with a perfectly creamy risotto. Basically you add one cup of broth at a time to the rice and stir until it’s all absorbed before adding another cup of broth and repeating until all the broth has been absorbed and the rice is al dente (about 30 min.) Luckily not much thinking is required while the broth is being absorbed and you are stirring so it’s a perfect time to multi-task (aka… pour yourself a glass of wine and catch up with the family or ring up a friend for a catch up chat). The rewards of your efforts? Every grain of rice is perfectly cooked and super creamy (and you get to catch up with friends/family). PURPLE- a bit sweeter and slightly nutty (in my opinion) and it tastes amazing raw (try tossing in salads for an extra crunch) it’s less fibrous than the green variety and has a higher natural sugar content. Purple asparagus actually has a green color core. When the purple asparagus is cooked for a while it will lose it’s purple color. Which is why it’s a little hard to pick out the purple asparagus in the photos of this dish. 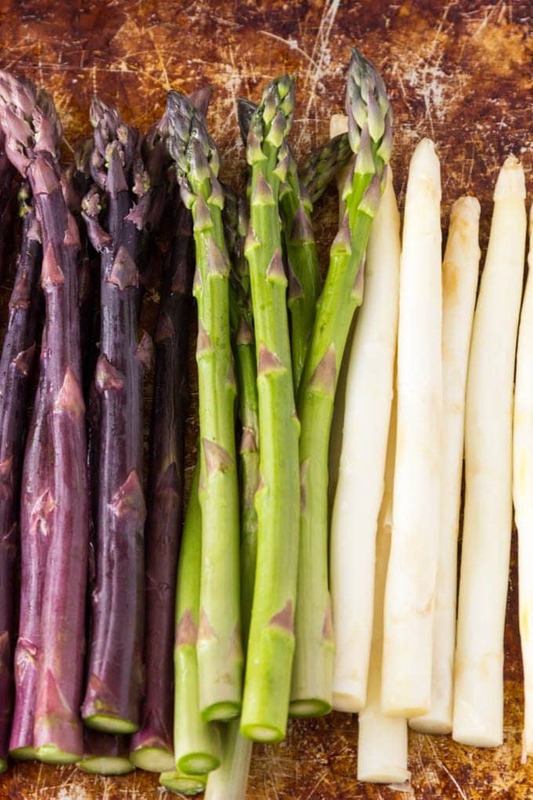 The purple color is a result of anthocyanins (which are potent antioxidant flavonoids that give purple asparagus some additional health benefits). WHITE- is more tender and more mild in taste. It’s also crazy expensive! Which makes sense since the growing process is much more complicated. White asparagus is essentially the same as green asparagus except it’s grown without sunlight . Dirt has to be constantly covering the growing asparagus (by building hills of dirt to keep the asparagus from being exposed to the sunlight ) preventing chlorophyll from developing,which is why the asparagus remains white and not green. GREEN- the traditional and most well-known and the variety with the most “asparagus flavor”(not to mention most available). This was my baseline for the taste test. Don’t worry if you can’t find all three colors of asparagus, this recipe works equally as well with any color (or combo) you’d like to use. 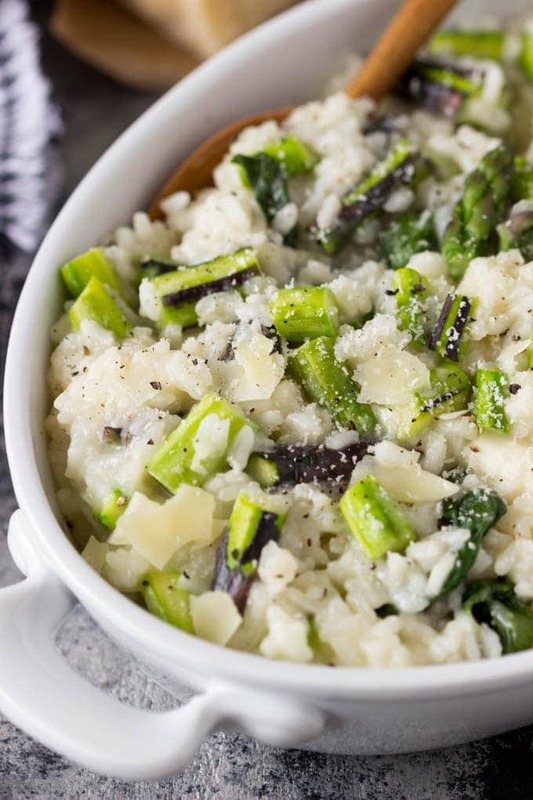 This asparagus risotto is SO creamy you'd swear it has to include cream in the recipe! Oh no it doesn't! The creaminess comes from the rice and the process of stirring the rice. Add fresh asparagus ( purple, green and/or white) and freshly grated Parmesan cheese and you've got one tasty Italian meal. Add wine to rice and stir until absorbed. If you prefer your asparagus more well cooked add to the pan at this point (if you prefer more crisp tender asparagus you will add near the end of cooking process) Add one cup of the warm broth to rice and continue stirring until liquid is absorbed. Continue adding one cup of broth at a time, stirring, and letting liquid absorb until all broth is used and rice is al dente (approx. 25-30 min). Add Parmesan cheese and asparagus (if you didn't add it earlier). Add salt/pepper to taste. Continue to cook until cheese is melted and asparagus is crisp tender (or fully cooked if you added asparagus earlier). Remove from heat and top with additional fresh grated Parmesan if desired. * To trim/peel asparagus Use a sharp knife to cut off the tough ends of stalks.For thick stalks of asparagus, use a vegetable peeler to remove the outer layer from the bottom half of the spear. For thin stalks of asparagus no peeling is necessary. Cut off tips (about 1 inch) and slice remaining stalk into ¼-1/2 inch pieces.